I’m not a theater goer. For entertainment, I prefer to stay at home and read, watch TV shows, or play games on my Ipad. It seems too much effort going out when I have practically everything easily accessible at home. I guess I’m lazy at heart. But that might have changed when an art critic-friend invited me to see Trumpets’ The Horse and His Boy. I sat through the play and I was touched by childhood magic. The play reminded me that there are some things worth the effort of going out and experiencing first-hand the full glory of an excellently put-together production. It was lovely. I enjoyed the flow of the story, the costumes, the songs, the play of lights and shadows, the puppetry, and the movement. The props were amazing. In my imagination, the horses were alive, talking, struggling, and experiencing pain and triumph the same as the human characters. How do I describe the contraption manipulated by two humans to make it appear as a talking and active horse? I can’t. You just have to see it. A play plays with the imagination that a movie can never do, I suppose. At first for me it was just a stage. But as the play went on, it transformed into the world of Aslan, that great mysterious lion that guided four children from Earth as they emerged from a magical wardrobe into a world peopled by talking animals. It has been a long time since I read the books of Narnia. I almost forgot it. The play made me remember how magical it was. it was almost disorienting when the actors, writer and director assembled on stage after the play to answer questions from the audience. They were themselves and no longer in character. That jolted me to reality. I’m not an art critic, so I’m posting this link to an excellent review by Orly of The Jellicle Blog. If it does not make you want to run or fly to the Meralco Theater in Metro Manila to see this play, I don’t know what will. 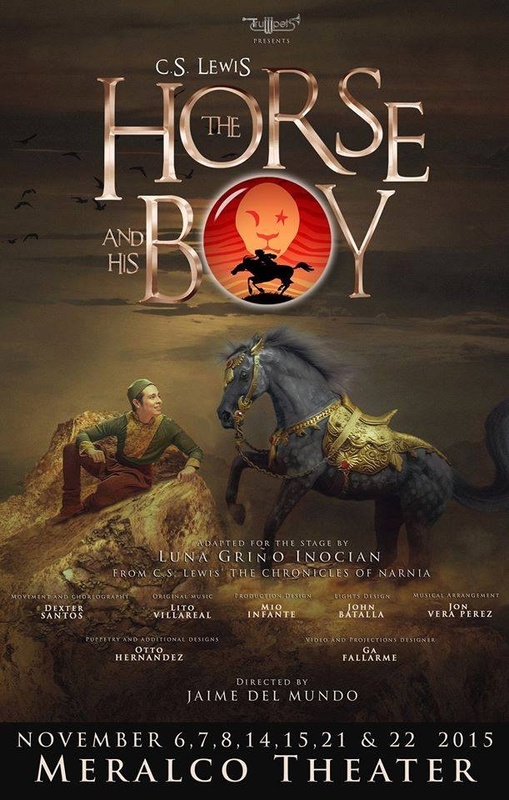 Based on one of the books from CS Lewis’ THE CHRONICLES OF NARNIA, THE HORSE AND HIS BOY is the tale of an orphan boy, Shasta, and a talking horse, Bree, as they journey towards freedom from oppression and slavery. They fly from a foreign land to Narnia, the place the horse calls home, and where the boy hopes to find who he is and where he truly belongs. Reconnect with beloved characters from THE LION THE WITCH AND THE WARDROBE – the grown-up Susan, Edmund and Lucy now reigning monarchs of Narnia , the faun Tumnus and, of course, the Great Lion, Aslan, and meet many new colorful and fascinating characters. Join TRUMPETS on this new adventure – a non-musical adaptation of C. S. Lewis’ beloved book, THE HORSE AND HIS BOY. For tickets and inquiries, you can call TRUMPETS at 901-4364 or TICKETWORLD at 891-9999 or visit http://www.ticketworld.com.ph. 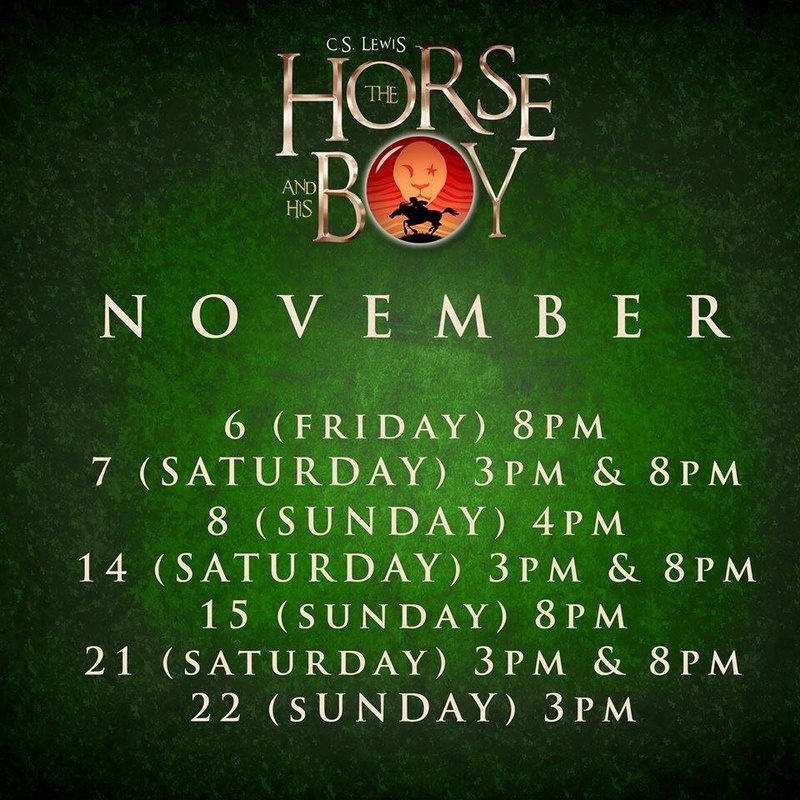 THE HORSE AND HIS BOY opens at the MERALCO Theatre starting November 6 to 22, 2015.